Here is what your weekly at-home hair care regimen would look-like. 1. Shampoo, rinse, towel blot gently. Leave damp. 2. Treatment, apply and distribute evenly, comb through at one-inch parting detangling from the ends first; use Mason Pearson Detangling Comb (Mason Pearson Combs are high quality combs with rounded soft edges and have no ridges in between the tooth of the comb. Everyone should own the Mason Pearson Detangling Comb). Cover with plastic covering. Leave 10 minutes with heat (or use 8 minutes heat from a blow-dryer and 2 minutes without). Cool down, rinse, towel blot gently. 3. Conditioner, apply, distribute evenly. Rinse, towel blot gently. Leave damp. Always finish with a cool rinse, this helps close the cuticle of the hair and make it much shinier. Don’t rub or towel ruffle the hair; you will tear up the hair’s cuticle and loose shine and elasticity. Here is how to Shampoo and Condition your hair the right way. Detangle hair: Make sure all tangles are removed from your hair BEFORE you wet it. When you hair is tangled and water hits it, the tangles become locked in. Brush it out (gently) before you get in the shower. First get a good detangling comb, they have very wide teeth. (Mason Pearson ‘Detangling Comb’ is the best comb money can buy). Comb your hair before you start to brush. Combing has to be done bottom up. Start to detangle your hair from the ends first and work up to the scalp. Go through some inches until all knots are combed out. After you detangled your hair by this method, use a brush to go through the whole length, top down. Do not brush abruptly. This will help shedding or “old hair” being loosened in the follicle to make way for tangle free, shampoo ’do. Easy! Combing is simple, work from the ends and work in sections. When you start at the ends, make sure the few inches at the end are completely detangled first before adding an inch or two above it. Starting at the crown of the head and combing downwards would simply create more tangles. Basically, you are trying to avoid combing through tangles or creating more tangles. If you’re using hair-styling products, you must change your shampoo routine. The mousse, wax and gel you apply in the morning will harden at the end of the day, so don’t brush your hair before shampooing in the evening. First get a good detangling comb (they have very wide teeth). Mason Pearson ‘Detangling Comb’ is the best comb money can buy. They are not cheap, but they’re worth it. Combing has to be done bottom up. Start to detangle your hair from the ends first and work up to the scalp. Go through some inches until all knots are combed out. After you detangled your hair by this method, wet the hair and scalp thoroughly with warm water. Apply shampoo and wash while massaging the scalp. Don’t rub your hair in lather. When you are finished, keep the lather in place for around one minute. This will lift the styling chemicals from the hair. Rinse and apply conditioner or treatment. Apply the treatment to damaged hair before shampooing. If your hair is damaged, wet the hair thoroughly and apply the treatment only to the ends for protection before shampooing. If your hair extends past the shoulder blade, apply treatment to the portion below the shoulder blade and gently rub the hair to let the nutrients penetrate. Be sure to do it in a gentle, soft action. For long hair, apply around 5 cc or one tablespoon-full of treatment. First get a good detangling comb with wide teeth comb; using Mason Pearson Detangling Comb. Comb your hair before you start to brush before you get in the shower. Combing has to be done bottom up. Start to detangle your hair from the ends first and work up to the scalp. Go through some inches until all knots are combed out. If your hair is really messy today, separate it and comb each strand on its own. After detangling your hair by this method, use a brush to go through the whole length, top down. Do not brush abruptly. This will help shedding or “old hair” being loosened in the follicle to make way for tangle free, shampoo. Wet your hair as though you are soaking it. First, thoroughly saturate scalp and hair using warm or cool water (100°F or 38°C) (hot water tends to dry out hair and scalp). The primary objective of shampooing is to clean your scalp, not wrestle your hair, so concentrate on massaging gently and allow suds to be distributed throughout hair while rinsing. Wet your hair thoroughly in the shower. Some people say only cool water, some people say only warm. Single strand of hair is very fine. If you rinse your hair with hot water, it will cause the cuticle to peal. Also, essential oil will run out. If your hair is long, try to keep it straight while you wet it. The main purpose of shampooing is to wash the scalp. The length of the hair doesn’t matter. If your hair is long, massaging the scalp with the fingers will also cause your entire head of hair to move. Since the hair is already receiving vibration and friction, rubbing and kneading it further in large amounts of lather will cause damage to the hair. You shampoo your hair almost each day, so master the correct shampooing technique to keep your hair looking healthy and lively. Shampoo your scalp! Only lather the ends. Shampoo scalp for 2 minutes. It is not necessary to lather too much- this can cause damage to the hair’s cuticle. Proper way of shampooing is to shampoo your scalp. Put shampoo on your scalp, not on your hair. Apply shampoo from the nape, around the ears and hairline. Gently massage the scalp throughout your entire head. Keeping your scalp clean and healthy is very important. The primary objective of shampooing is to clean your scalp, not wrestle your hair, so concentrate on massaging gently and allow suds to be distributed throughout hair while rinsing. It’s not necessary to do the “rinse and repeat” routine unless you have an oily scalp. It is not necessary to lather up so much! Too much lathering can cause damage to the cuticle of the hair. Work it gently through your hair starting at the root area and moving down toward the ends. Remember, the cuticle layer (outer most layer) of your hair grows out in this direction. Gently rinse your hair. Just as you wet your hair in the first step, trap the water and massage with it. Do not use strong water pressure to rinse your hair. Now, squeeze the excess water from your hair. Apply a sufficient amount of treatment to where your hair is driest first. For most people, this means the ends. Massage the product into the hair. Rinse thoroughly. Excess shampoo residue can cause hair to be dull and flat looking. Remember, you’re always aiming the water away from your scalp toward the ends. Running your fingers gently. Certain kind of styling materials can change the way you shampoo the hair. Styling materials used will harden up throughout the day. It should be thoroughly rinsed out before applying the shampoo, but never brush it out before wetting. Apply shampoo, gently lather and massage your entire scalp. Let it sit with lather for 1 minute. This will cleanse the build-up of the styling material on your hair. After rinsing it out, apply conditioning treatment. Hair is always loosing protein through daily abuse. Treatments revitalize and replenish lost protein and nutrients in hair. It is necessary to apply Treatment at least once a week. Long hair tends to get damaged easily. Any hair passed shoulder length can be considered damaged. Hair is a build-up of dead cells, so it does not have the ability to heal and revitalize its own damaged areas. Natural oils from your scalp can only reach to your ear line. If you keep this in mind every time you shampoo your hair, it will make a lot of difference. Treatment is applied to replenish damaged hair with nutrients. The essential complex contained in your treatment product will penetrate each strand of hair through the cuticle and replenish lost protein. I recommend that those with medium to long hair use one treatment for each shampoo. The amount applied varies, but roughly one teaspoon for a medium length hair and 2 teaspoon for long hair. Apply to your hair below the ears without diluting. Make doubly sure the hair is not too wet. For damaged hair apply treatment before shampooing. If your hair is damaged, wet your hair thoroughly and apply conditioner to protect your hair before you shampoo. Apply conditioner only on the ends. For hair longer than shoulder line, apply conditioner and let it penetrate into the hair as you gently massage your hair. The amount of the conditioner is about the size of tea spoon for long hair. If you have bleached or colored hair, I recommend that you use a treatment after every shampoo. Now is the time to comb your hair. It’s easy to get a comb through hair with Treatment in it. Start at the ENDS, not at the root area. This helps remove knots and tangles quickly. Work your way up the shaft. Now, leave it on for a while. Combing your hair out should be much easier. Process 5 to 10 minutes, rinse. Finally, Apply Conditioner in one hand and rub palms together to evenly distribute. Apply conditioner from the middle of the hair shaft down to ends. Do not massage conditioner onto scalp unless scalp is dry. Comb through hair to distribute evenly. Leave conditioner on hair—it only takes a few seconds. Rinse thoroughly. It’s important to rinse shampoo and conditioner from your scalp. 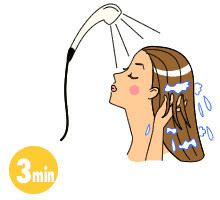 Stand under the shower and gently lift hair to permit the water to reach the scalp. Hair will be thoroughly rinsed when it feels consistently clean as you run your fingers from scalp to ends. 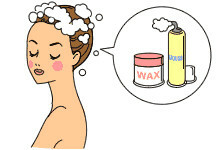 Conditioner is a surface active rinse, so it acts topically just like a make-up and/or a lip-stick. Or you can think of it as a skin lotion for the hair. Just as you apply skin lotion to firm and tighten your skin after washing the face, conditioner closes the opened cuticles and changes the hair’s pH value to a weak acidity. Normally, Conditioners have a lower pH value to help close and smoothen the cuticle layers and to give it shine. A Treatment on the other hand has the vital moisturizers, lipids and amino acids. It boosts, seals, enhances and replaces depleted strength and reinforces the internal hair fiber. Many believe applying a lot of conditioner will make the hair shinier, but this is wrong. Conditioner only needs to adhere to the hair surface. After shampooing, towel blot excess moisture out; do NOT rub down with a towel. Gently blot the moisture at the ends to avoid friction between strands of hair that will cause cuticle damage. Dry your hair with a towel not to “wipe” but to “absorb moisture.” Never rub your hair forcibly by wrapping your head with a towel. The water attached to the hair will travel down naturally after a while, so gently pressing a towel over the hair will remove moisture effectively. Don’t rub or knead? This is an iron rule that applies to every step of the shampooing process. Wet hair is very fragile and prone to damage. As you dry the hair, the cuticle closes and the tensile strength returns. This will also reduce the time the hair in its weakened state; making the hair stronger and less prone to breakage. Long hair tends to get damaged very easily. Any hair passed shoulder length can be considered damaged. Hair is a build-up of dead cells, so it does not have the ability to heal and revitalize its own damaged areas. Natural oils from your scalp can only reach to your ear line. If you keep this in mind every time you shampoo your hair, it will make a lot of difference. The portion around 10 cm from the scalp is young hair with little damage, but the remaining portion has been wind-blown, washed in shampoo and rubbed with towels for many years and should therefore be worn to some extent. If the hair is long, the natural oils secreted from the scalp can’t travel to the ends, so the hair will become excessively dry over time if nothing is done. Short hair of up to about 10 cm has plenty of natural oil. Since the hair is young and strong, handling it a little roughly won’t cause too much damage. However, this is not the case with hair of over 10 cm. ideally; the portion below 10 cm from the scalp should not be touched during shampooing. Of course that isn’t possible, but taking heed of the aforementioned points will certainly change your hair for the better. Let’s start a new regimen today! Some people let their hair air-dry, but this seemingly “natural” approach is really NOT good for the hair. After thoroughly absorbing moisture with a towel, apply ID.CARE heat silk lotion, and detangling Cream over your hair (ask your stylist for the recommended hair care regimen). Start from the nape area, with the portion above the forehead dried last, so that the top portion will not absorb all the moisture. If the top of your hair is always flat no matter how long you blow-dry, it is because the bottom part is still wet and water is being channeled upward. When the scalp is completely dry and the hair is 80-percent dry, style your hair into the desired look. Air-drying your hair after shampoo will cause more damage than blow drying! Why blow-drying is preferable to air-drying. 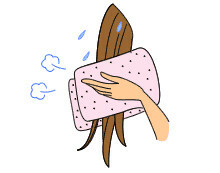 According to the Japanese instructors, blow-drying is always preferable to air-drying for one main reason. When the hair is wet, the water molecules fill the cracks in the cuticle and absorb into the hair. Like a sponge, the hair expands enough to accommodate the water. The water exerts a slight pressure from inside the hair which stresses the cuticle layer and lifts the cuticle outwards slightly. If the hair is in a stressed state long enough, the hair’s cuticle layer will split and peel up to relieve the pressure. The cuticle is a hardened dead layer of protein, and once the stress fractures happens; there is no permanent repair solution. When the hair is blown dry using warm air, on a low setting, the water is evaporated out of the hair quicker, relieving the stress faster. It is very important to not rough up the hair while blow-drying, because that damages the cuticle, and it is recommended using the fingers only, blowing in a downward motion from roots to ends. If the temperature is too hot, that will not benefit the hair at all since it will dry out the outside of the cuticle very quickly, possibly burning it, while the water inside has not yet evaporated. The water locked inside is evaporating out, re-moisturizing the cuticle and encouraging the fuzz. I choose to recommend blow-drying TRd hair on low, in a downward motion. Do not iron if it doesn’t need extra smoothing and if it’s very straight, unless of course it’s time for a root touch up and you need to smooth the hair for an occasion. Begin styling the hair when the scalp is completely dry and 80% of the hair is dry. After towel drying your hair, apply a leave-in conditioner. Then blow-dry the nape first, leaving the area above the forehead second. The bottom part should be dried first, so that the top part does not absorb the moisture from the bottom. This offers body. Always choose to blow-dry TRd hair on low, and in a downward motion. Do not iron it unless you need to for an occasion or it’s time for a root touch up and you need smooth the hair. So, you say to yourself “Where do I go from here?” I understand the language, and now I know how to take better care and to create beautiful hair, based on hair that is in optimum condition…simple, isn’t it?